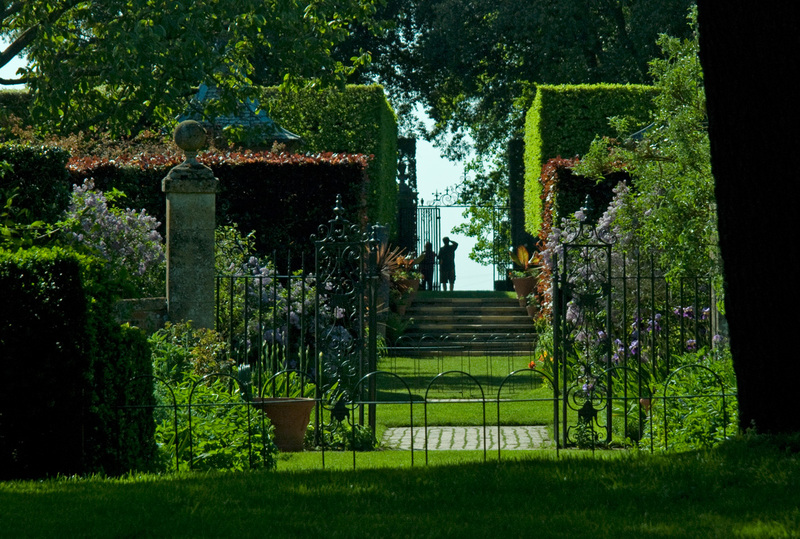 Today’s trio of images come from Hidcote Manor Garden in the Cotswolds. Hidcote is a National Trust property whose gardens were developed by the American horticulturalist Lawrence Johnston in the early years of the twentieth century. The garden is described as one of the best examples of those developed during the ‘Arts and Crafts’ movement and is divided up into a series of ‘rooms’ each with its own atmosphere and character. It is a beautiful garden to slowly wander around on a summer’s day. Click on any of the links in this paragraph to know more. 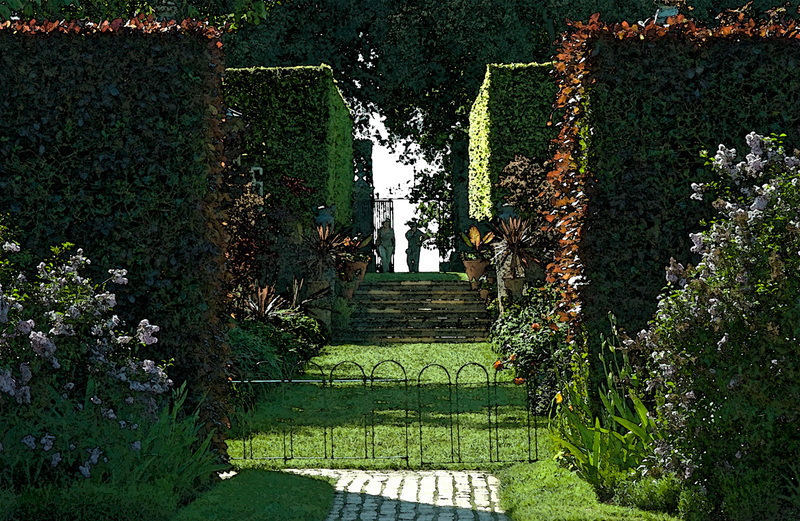 One garden view captures everyone’s attention: the view across the garden, down an avenue through a series of gaps in the hedges to the far side of the garden where there is a decorative wrought iron gate. From a distance people at the gate appear to be on the horizon. And in one sense they are because Hidcote is on a hill, and beyond, stretching out far into the distance is the Vale of Evesham. Three images of the same view although not all from the same place. The first is the ‘long shot’, the other two are taken from closer points. The second image did not look right in colour – a little too contrasty and green and I felt it was better suited to a B&W conversion with a subtle sepia tone. The final image has been given a work-over in Photoshop using a combination of Dry Brush and Watercolour filters to create a painterly effect. Let me know what you think of these. And do click the images to see enlargements – they do look their best when enlarged. This entry was posted in Country Houses & Gardens and tagged Arts and Crafts movement, Hidcote, Hidcote Manor Garden, Lawrence Johnston, National Trust. Bookmark the permalink. That monochrome shot is fantastic!! Well done! Thank you, Adam. I really wasn’t sure whether to include that one or not – I still feel a little ambivalent about it. Glad you like it. Great shots, love the silhouette of the people in the first shot. Many thanks. I guess I stood around for quite a few minutes periodically for people to show up in the gap and others closer to me in the garden to clear off. Patience was finally rewarded! Thanks Andy. As the text of the blog entry said, I wasn’t quite certain I liked this initially but it’s growing on me. Thank you for providing the links, as well, Andy…nice to read of the history of a place so far away. I think I prefer the first and third shots over the B&W…I do like the color in these particular images. And the painterly effect is very nice on the last shot, as well…much easier to see in the enlarged view. NIcely done, Andy…thank you. What a beautiful place Andy. I love the B&W image…all the shadows and mystery…love it. Thanks you Edith – I’m pleased you like the B&W one – the original was very green and rather garish, getting rid of the green simplifies it. Awesome, awesome, awesome!! That second shot is totally the bomb here, Andy, I just LOVE the natural tension in it with the b&w and the person walking at the end there… fan-flippin-tastic! Gosh Toad – thank you so much. My wife – the one walking across the gap – is now your latest fan. It’s a long time, she says, since anyone called her fan-flippin-tastic. better smarten my act up a bit! Okay, I’m going to against the tide here Andy. I like the B&W but I really like the last one. I think the painterly effect won me over. Thank you Len. Occasionally using one or two of the artistic filters in Photoshop pays off, I felt it worked quite well with that image. The sepia is my favorite here, but it’s a tough choice. 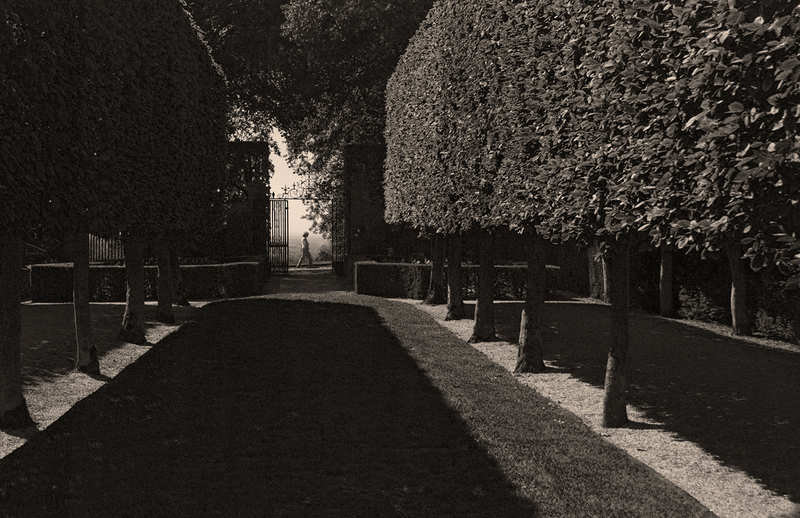 The sepia has simplified the composition a bit and the figure walking past the gate is in perfect position. It’s exceptional. Thank you so much Ken. I’m beginning to quite like this shot after all! Lovely set Andy. I very much enjoy visiting these National Trust Gardens, as there are so many photo ops. By the way the B&W is my favourite as I like the person walking past and the clean lines. Beautiful job Andy. I really like the B/W! Thanks Phillip. The B&W image is gaining popularity. Really like the black and white image. It works really well. I imagine the color version distracts the viewer from seeing the detail that makes the photo: the woman in silhouette. With black and white, the eye is drawn right to it. Great job going with your gut on that. Always trust your eye. Welcome to my blog, George, and many thanks for your comment. I do like the B&W Andy . There is a story in there I’m sure … is it full moonlight … the avenue of trees and then the solitary figure crossing ..
My assistant was very obliging that day! It seemed to suit B&W and then I introduced a little sepia. Thanks for the comment, Poppy.